Newswire – September 29, 2011. UNIQUE/PERENY Fast Fire sintering and binder burnout closed loop furnaces engineered by HED International are fully automated. Designed for manufacturing a wide range of products when dependable precision is essential. Energy saving design of low thermal mass molded ceramic fiber board furnace lining and conveyor is setting new performance standards. This includes faster heat-up and cool-down capability whenever necessary. 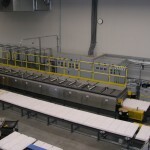 Custom designed systems are engineered to meet specified requirements and include robotic load and unload stations.